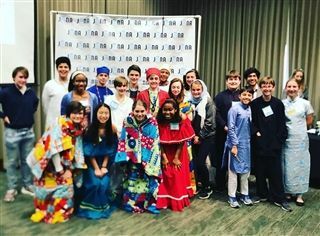 On January 31 and February 1, over 300 students representing 50 nations met at Birmingham Southern College for the 28th AnnualJunior United Nations Assembly of Alabama (JUNA). 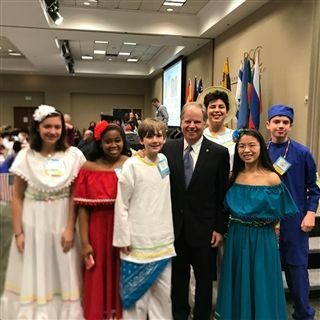 This year, Highlands’ students had the honor of proudly representing the nations of Chad and Nicaragua. Chad’s delegates tackled the pressing problem of illiteracy and lack of educational resources in their country. While the Nicaraguan resolution confronted the problem of limited educational opportunities and poverty throughout their country. Beginning in August, the students spent several weeks researching complex problems facing their countries. Over the next two months, the delegates drafted their two-part resolutions with real-world strategies meant to address the issue they chose to tackle. These resolutions were submitted in November and students received their “JUNA books” in December. The delegates committed weeks of time to the arduous task of researching the other resolutions and preparing detailed questions for those delegates. In addition, our delegates prepared speeches to defend their resolutions, created brochures which described their issues, researched an international crisis which faced the Security Council, and much more. These tasks -- researching, writing, critical thinking, problem-solving, and collaborating -- enable our students to apply all of the skills they have honed here at Highlands. 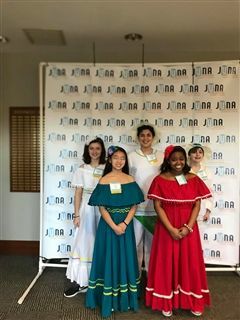 For those delegations that pass from small committee to general assembly, JUNA provides a unique public speaking opportunity in front of hundreds of people. Bo Garrett, our Middle School Chair, and Shara Kernan, our Learning Specialist, work closely with Highlands’ students from August to late January to ensure that students are prepared to participate in this complex and high-pressure event. 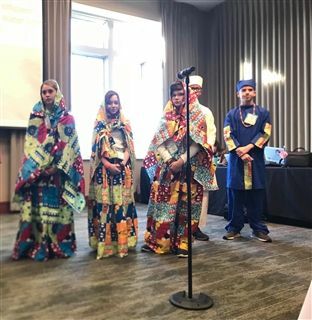 Members of our Chad delegation were Nora Barton, William Horton, Grace Pelt, Andrew Rowe, Carlton Wallwork, and Chloe Williams. Members of the Nicaraguan delegation were Sydney Porter, Caroline Reddington, Mary-Candler Schantz, Nour Shoreibah, and Aubrey Turner. This year, our Chad resolution passed in General Assembly by a 38-9 vote, one of the widest margins achieved at this year’s event. The Chad delegation was recognized for their “Outstanding Presentation” -- a new award this year. The Nicaraguan delegation earned one of the highest awards at JUNA as one of the “Best Prepared” delegations. We are extremely proud of our delegates for their hard work and perseverance. We would like to express our sincere gratitude to Mrs. Shundra Davis for making all of the beautiful traditional costumes for both teams. Thanks also to all of the Highlands parents, students, and faculty who made JUNA a positive experience for our Highlands School delegates.